Boy did I need a weekend to just relax. It was so nice just being home with no where to go and nothing planned and hanging with my two favorite guys. Today's project is from "The Cutting Cafe". Regina has lots of new school digital stamps and I just had to get Ethan's cards ready for the first day of school. School doesn't start here until Aug 31st, and boy are we ready to go back. Love this Christina, your ideas are always so inspiring. Love the card. I have never used digital files before and liked how easy you made it look. Thanks for sharing with us. Your blog is like my morning coffee. Love it! Sooooo cute!! All of your creations are so gorgeous. Thanks for the inspiration! Christina, LOVE LOVE LOVE the card! Wild Saffron is one of my all time paper packs, and the punch sets this card off ! Thanks for the chance to win ! Cute card! My girls start school today~ YEA! oh I LOVE THIS.. I have never printed out digital files b4. I have to try this! I really need to get started on my back to school cards too. I also like to make cards for the new teachers! Such a cute little card and I love the digi stamps from the Cutting Cafe, what a nice set of cards they would make for a teacher. Love it Christina! Your cards are always so simple but so beautiful! Thank you for sharing your creativity! Cool! Love those images! I work at a school and we start back on Wednesday this week! You can contact me on my blog. Love the card. I have never used digital files before,looks like fun. The "Back to School" card is adorable. I really love the whole layout. The Martha Stewart punch is so cute. I love this card! We're with you, we start back to school on Sept. 1. Oh, I just love that card. Would love to win that digi stamp set. Thanks so much. Cute card. I love the colors you used! I would love to win this set for back to school projects. This is such a darling card!!! What a cute card! I love the digi stamp set you used!! Thanks for showing how to use the digital file! I am heading over to the Cutting Cafe to check out their site! Super cute card. I love the colors! Keep up the good work! That is such a cute card. I love the apple. Digi Stamps are great. What a cute card! Thanks for sharing. Love this set....ADORABLE! Love the card...great paper! what a great giveaway, would love to try digital stamps.. I loved the punch you used!! Very cute Christina, Im a bus Driver and my school systems starts back on Wednesday. Thank goodness my bus has AC cause its going to be HOT HOT HOT. So cute, love the card and the file is great. I would love to use this to make a card for my 4 year old god daughter who starts 'proper' school in September. This card is wonderful! Love it! Very cute back to school days. Love it and want to make it for my grandson. Thank you for a chance to win the contest. Love the card. Thanks for sharing. I am excited to try the stamps from the cutting cafe. Will be visiting the site today. Oh this is great. I want to make cards for all my friends still teaching. This will be my first September not teaching in 30 years. I will miss everyone but I am looking forward to a stress free September. Great card. I also made a back to school card for my cousin who is returning to teaching Grade 2s. You DO make it look EASY, Christina! Adorable card! And, another SUPER video tutorial! Love the card. Were in PA too, so school starts at the same time. But my guy is going to be a HS freshman and my dtr a college freshman, yikes ! I need this file, lol, plus Friday the 13th is my lucky day !! So Cute. Thanks for the video. Thanks for a chance to win. What a CUTE set!! GREAT job w/your sweet card Christina! So darn cute. I need to get started on a first day of school card. Love the card... stamp set would a great thing to have ans use for my classroom...Cutting Cafe always has such cute digi stamps. Love the card. I look forward to using digital images. Thanks. Great card! You are such an inspiration! Love your site! Love the card, I have got to try it!!!! Cute card...great use of that awesome file! I love this card. What a nice way to celebrate the first day back to school. Thanks for sharing and for the opportunity to win. Great card! I don't have any digi sets, winning this would be a great way to try it out. Thanks for the opportunity! Cute card. It has a rustic feel to it. I like that alot. School doesn't start here till 9/7/10. We still need to school shop for clothes but other then that they are ready. This is a great card we have already started school but i would loved to win it, I could use it for my scrapbooking. Love this card -- you are soooo inspiring! As usual, you come up with just what I needed. Perfect for my grandson's first day of school. Love your ideas. I love your BTS card. The colors are very nice and I love the apple! Thank you for showing how to use the Cutting Cafe digi stamps. I've been wanting to buy some but wasn't sure how to use them. Love your card. Love the card, Christina.....Thanks for a chance to win.......hope I do !!!! Cute card Christina. I hate to think about school starting again, but know that it is just around the corner. Time to get going. What a great card! I love this digital stamp set. It would be wonderful to be the winner of this wonderful set of stamps. I really enjoyed the video! What a great idea. My daughter likes Hello Kitty so for the first day of school I plan to make her and her friend a card. Her friend likes Hello Kitty as well. Caint wait for her to get it. That is so cute... You have so many adorable ideas.. Thanks for sharing. Love the Card Christina! I've never used any digital stamps before..would be interesting to try! I do gotta question for ya though.... Why would you make a back to school card? I've never done that and wondered who do you give it to? the teacher? your child? Just wondering cause I've never done that and would like to try it but don't know who I'm making it for... thanks for any answers to that! Have a great day! This card is so cute. I would love to try the digital stamps. Great card! I was working on some back-to-school scrapbook pages. Do you scrapbook? Would you do one with this cutting cafe set? I would like to see what you dream up for it. Digital Stamps are a new idea for me. Thanks for demonstrating how easy they can be! Really cute card. Perfect for this time of year. Cute card! Love the Cutting Cafe'! Once again Christina you outdid yourself! This card is so cute! I really love all the distressing! I am shocked that school is starting so early in some places. Growing up, we never started before Labor Day. I can see why families all have to take vacation in 2 months of the year when the children are out of school. I've been thinking about trying the digital stamps you are using. Hope I win your giveaway! Our schools start 8/30 -- but I work in the school office year round, so it NEVER ENDED for me! Great card! I love the use of the string in the background. love the card, the person getting it will be so overjoyed. Christina thank you so much for another opportunity to win something nice. Beautiful card. Love the apple. I am really enjoying your Cutting Cafe videos. Very nice "school" themed card. Thank you for doing another giveaway!! =) I hope you have a fantastic week. Once again you have come up with wonderful ideas. Hope I win, even though I have not worked with digital stamps. Wow, Christina, what a great card. Cute card! Great idea - thanks! Wow what a card!! So simple to make. This giveaway is awesome!! Thank you! very cute card, I have never used digi stamps or system I often see things where they talk about it but it's new to me. Thanks for the chance to win. Great card, now I am inspired to make a couple cards for my grandchildren. I guess I better get busy. I would love to win the digital file. What a great idea to bring a smile to your child on his/her first day of school! I love how you made the card. Thanks for sharing. So cute..... I love this digital stamp set. Cute -cute - cute! Great way to start back to school! Super cute card!!! TFS!! Loving the digi stamp set! Thanks for the chance to win! This set is so awesome I can't wait to get my hands on one. I would love to win that! I will be making things for my grandchildrens' back to school days! Thanks for the chance! Love your ideas Christina. You are a very talented lady! This is a great card - you are so talented! and thanks for the chance to win the Cuttin' Cafe digital file - I would love to try one of Regina's files! 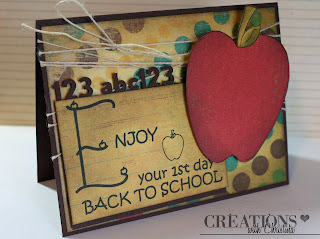 Love this idea - back to school is always so exciting! What an adorable card! I have never used digital files before. All your cards are so inspiring. Also thanks for the storage tips and sites. Cute card. I am just starting to use digital stamps and I am loving the coloring! Thanks for showing me something I hadnt seen until now, the Cutting Cafe. Now I have another way of scrapping. So nice when you have giveaways. THANKS so much! Such an lovely card!! Thanks for a chance to win!! Great time of the year for this design. I would give one to a teacher too as the first day can be crazy! Great card and thanks for the chance to win!!! Hi Christina! Don't put me in for the drawing...I'm just stopping by to say what a fabulous card for the give away! A great card, just the most perfect way to get your son ready to hit the books for an exciting year. Love the papers you used. Thanks for shareing. this is so dang cute! Thanks for the great idea! First time to your blog and I am having fun touring! The card is lovely, and the video is awesome! I love the use the double dimensionals. Thanks for sharing your creative talents. Super cute! Love all that thread wrapped around the card. Thanks! Love your card design. Really cute. Great card. I'm really liking the MS Punch. That card is very cute. Can't believe it's time for school to begin again. Love your blog and all your great ideas. Thanks for a chance to win! What a nice card for your son. I've never used digital files, but after watching your video I might be brave enough to try. Thanks for the inspiration. Love all that you do. This is very, very cute. Thanks for the chance to win. Very cute project for a child nervous to go back to school!! Loved you video, thank you so much, perfect card for my princess's new teacher!!! Just a down right beautiful card creation. Just discovered your blog on this hop and am now a follower. Can't wait to see your archives! Thanks for sharing your talents with us! I so look forward to your videos..your ideas are so inspiring! Thanks! What a sweet card. I am always looking for school/teacher ideas. Thank you for the chance to win this lovely set. How absolutely beautiful. Loving the "Big Apple"
It's amazing how you always come up with these beautiful ideas. I'm always excited to see what you come up with next! Really cute. You always have such great ideas. Very cute "Back To School" card. Socute!! !